The Elwins have released a new mind-bending stop motion video for lead single ‘So Down Low’. The track’s exuberant energy is perfectly rendered by thousands of Post-It notes. The video is the first single off of their 2015 LP ‘Play For Keeps’, out now on Hidden Pony. 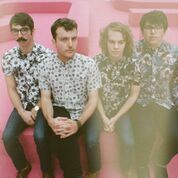 Taking the best bits of pop and rock music from the past five decades (despite the guys having only been alive for a little over two), The Elwins have delivered a dose of dancy bliss that appeals to virtually anyone. The new video is another reminder of the band’s never-ending creative well, a relentless vitality that cannot be contained. Pushing themselves as far as they can. In the most entertaining way possible. The band will also be playing a number of dates over the coming months, with a full fall cross-Canada tour TBA soon.